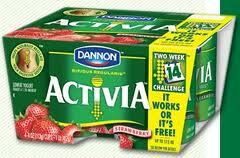 In my opinion Activia is probably one of the worst fake healthy foods available on the market. Every single time I see Jamie Lee Curtis shilling this stuff on TV I want to throw a shoe at her. I guess her residuals from Halloween aren’t coming in like they used to so she had to resort to this. The worst part is that Activia knows that what they are promoting isn’t healthy, that the claims that it makes when it comes to helping solve your digestion issues are unsubstantiated. In fact they are so confident that they are lying that they settled out of court a few years ago when they were sued concerning the false claims that they were making about their products. Would you honestly want to buy a product from a company that is this shady? There are now a wide range of Activia products so I am just going to concentrate on their regular strawberry and their light strawberry varieties. Let’s look at the regular kind first. 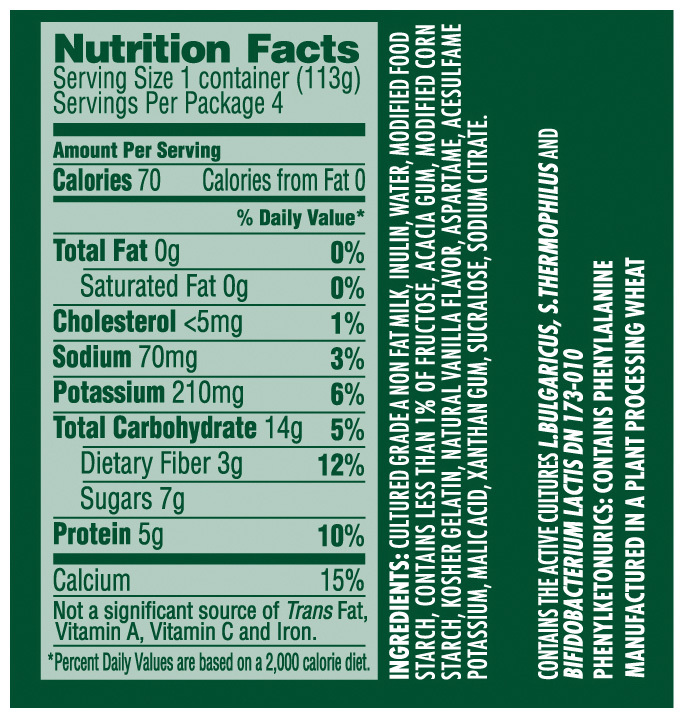 The first things that stand out when looking at the ingredients is sugar and fructose. One type of sugar wasn’t good enough so they decided two would be better! That really is an awful lot of sugar for something that is supposed to be healthy and good for you, especially when it is third and fourth on the ingredients list. Is it just me or is there a whole lot of ingredients in it? Yogurt does not that many binders! Also, there is carmine in it, which is a coloring derived from the boiled wings of an insect. It may be a natural way to get a color but if you are a vegetarian that would be something to avoid I would think. The only thing I will give them credit for is that they use real strawberries, however they have added ‘natural flavors’ which kind of messes the whole idea of using real fruit up. Lastly, I want to talk about their patented ingredient, the one they brag about helping your digestive system; bifidus regularis. They claim that this pro-biotic culture helps regulate your digestive system, but this fact is not proven! They are selling this product almost entirely based upon one ingredient that scientifically isn’t proven to help your digestive system. Shame on them! Never mind the fact that for it to supposedly work you have to eat it three times a day for two weeks. Funny, they don’t mention that on their website. Also, some people report getting very bad stomach aches from it, making their digestive systems even worse than they were before they started eating it. This product sure sounds like it’s healthy, doesn’t it? Their light version of the same product has pretty much the same ingredients. Our friend fructose is there again, but this time he is joined by aspartame AND sucralose. That’s right, not only is their sugar, there are also TWO types of artificial sweeteners! Artificial sweeteners are known to cause a lot of people to have stomach issues, so why would it be in a product that claims to help balance your digestive system? It makes no sense to me why people would eat this thinking that there stomach issues will get better by doing so. The fact that there are so many different Activia products around now just proves the fact that the American public do not read labels or do simple research into the claims of the products that they consume. If people ate more healthy they wouldn’t even need to try eating products such as this that claim to help them digest food better. Posted in Fake Health Food and tagged Activia, Yogurt. Bookmark the permalink. It is well known that the South has become a hot spot when it comes to the obesity crisis in America. Tennessee, the state I live in, is the buckle of the diabetes belt with over 30% of adults obese. If you also count in adults who are overweight it comes to over 60%. With that being said it is not hard to figure out why these numbers are so high. People eat like crap. From my own experience it is very difficult to find a wide array of healthy food products in just one store. We have Bi-Lo Publix, Food Lion, Walmart, Whole Foods and an Earth Fare. Often I’ll be searching for ingredients for recipes and I will have to hit three different stores just to find what I need. Many of the grocery stores, if not all, in the lower income areas carry a very poor selection of fresh fruits and veggies and seem to center around their in-store deli foods, such as fried chicken and chicken salad. Way back in the bad old days people ate fried foods down here because they were cheaper to make than fancier dishes. Instead of progressing away from that the South is still stuck in a rut. 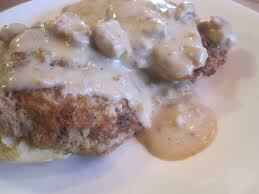 Even if people can afford better food they will still pick a chicken biscuit over a bowl of healthy cereal. I’ve had several different people tell me that they will eat the foods that they love until the day that ‘God’ decides that it’s their time to go. So, not only do you have generational eating habits that are bad you have religious dogma thrown into the mix for good measure. You are surrounded by bad food down here. Yes, all of America is crowded with fast food shops, but down here there are also a huge amount of buffet restaurants. I used to live on the West Coast and I never saw as many Asian buffet type places out there as I see here. Seriously, you can’t go down a main street without finding one. They all reheat the same unhealthy Sysco shipped frozen food and the people swarm into them like locusts. Also, there are a lot of ‘down home’ type places that serve almost nothing but fried foods. To be quite honest I think the only way things are going to change down here is if people get better access to good food and realize that it doesn’t cost a ton of money to eat healthy. The prevailing attitude around here is that only the rich yuppies go to Whole Foods and Earth Fare. Okay a lot of them do! However, my boyfriend and I don’t earn that much money and have begun to buy food that is better for us. Posted in Eating Healthy, The South and tagged The South. Bookmark the permalink. I found this recipe online and wrote it down on a piece of paper since my printer it busted. If this is your recipe I will give you credit. It originally said to pre-heat oven to 375, but I did mine at 350 because I didn’t want to accidentally burn the bottom of the cookies. If you like your cookies to be more chewy and thick then do not press the balls of dough down, just leave them the way they are. If you like them thinner and more crunchy press them down. Cream together the butter, white sugar and brown sugar. Beat in the eggs one at a time then stir in the vanilla. Combine flour, baking soda, salt and cinnamon then stir into the creamed mixture. Mix in oats and whatever else you want to add such as raisins. Cover and chill dough for at least an hour. Preheat oven to 350. Roll dough into walnut sized balls and place them two inches apart on a cookie sheet. I use parchment paper on my cookie sheets which makes it very easy to transfer the cookies and it’s an easier cleanup. 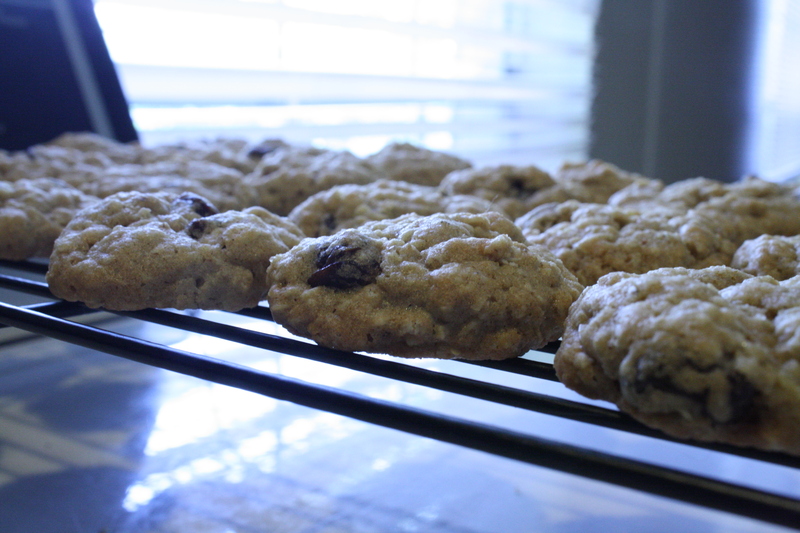 Posted in Recipe and tagged Recipe, Soft Oatmeal Raisin Cookies. Bookmark the permalink. I read an article in the NYDaily News in which they talked about Venus Williams, Shaq, Apolo Ohno and Eli Manning promoting the new monstrosity that is the Triple Double Oreo. 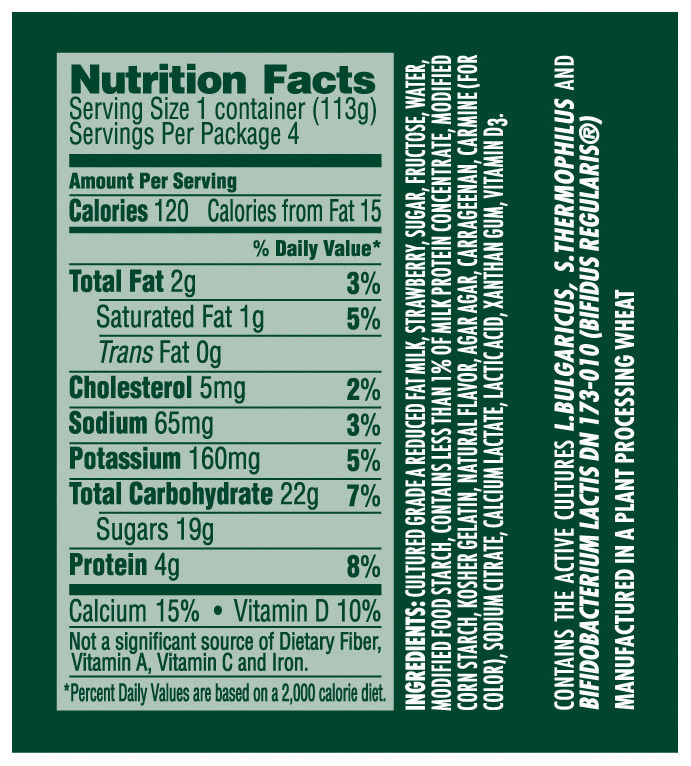 In just ONE cookie is contained 100 calories and 4.5 grams of fat. Yes, you read that right, you aren’t imaging those numbers. Here is part of a press release that Nabisco has put out concerning their new product. 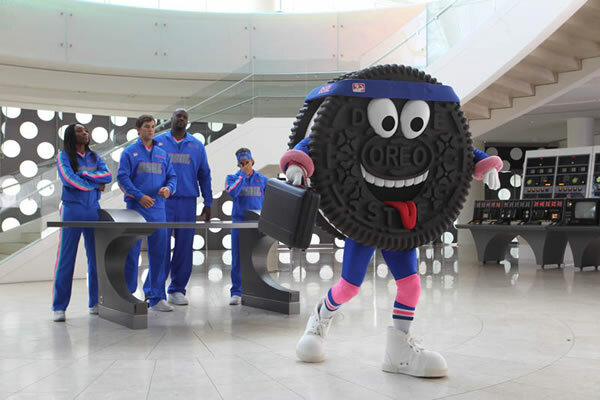 To help launch the new cookie, the OREO Brand has enlisted the help of both OREO fans and Team DSRL, including Shaquille O’Neal, Eli Manning Venus Williams, Apolo Ohno and of course, Stufy, the DSRL mascot. New OREO Double Stuf Racing League TV advertising will begin airing in early September. DSRL veteran Shaquille O’Neal loves the challenge that the new cookie poses to his team, and wants to know if OREO fans are game. Oh, I’m sure that Shaq thought of that quote all by himself! Are you wondering what the heck DSRL means? Here is a quote from that same press release explaining what it is. 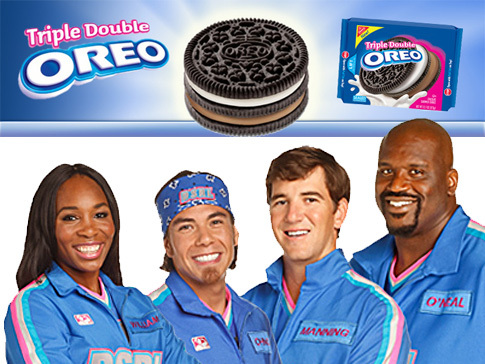 The OREO Double Stuf Racing League officially launched in January 2008. To compete in a DSRL lick race, each person twists their cookie open and licks off all the creme. Then, each person shows their cookie to their opponent, dunks it, eats it and drinks the glass of milk. The first to finish twisting, licking and dunking wins! Eating more than just one of these things could quite possibly give you a stomach ache or put you in a diabetic coma, but that’s okay it’ll be fun! What really gets me is that these athletes think it’s okay to promote this crap. I mean seriously, I guess that money is more important to them than telling the truth to children. I can imagine them saying that they are not in it to promote this cookie to children, that they are just having fun and promoting a cookies to everybody. If that is the case then why is there this guy below? I don’t think that dancing cookie was put into commercials and advertisements to please me because I know that there is somebody in the suit. I can imagine kids seeing that cookie and begging their parents to buy the product for them. The strong parents will say no, while the weak ones will give in just to shut up the kids. Athletes, and celebrities in general, need to start acting more responsible instead of collecting money from companies that promote unhealthy products. Those athletes sure didn’t get into shape by eating unhealthy cookies! Why is it okay for them to promote these products to kids then? Kids aren’t going to get in top physical shape by eating these things, they are going to turn into obese blobs. No, it’s not okay to feed even one of these cookies to your children, and these athletes ought to feel ashamed of themselves for participating in this farce. Posted in Rant. Bookmark the permalink. So, according to them they use less than half organic ingredients in their products, meaning that the other 54% of ingredients are GMO based. That isn’t exactly natural is it. It certainly doesn’t make me think of one of their employees walking through a jungle fondling mangoes like they do in those commercials that they run. All natural should mean ingredients that are not based on something that is created in a lab. To living well. To eating better. To ingredients grown in the sun. To giving your body the good food it needs. To a better you. To choosing real, whole foods that care for you and the environment. I’m sorry but 54% of the ingredients that you use are not ‘real, whole foods’. Instead, some scientist at Monsanto threw a bunch of chemicals together and created a frankenfood concoction, that is anything but what you say that you represent and support. 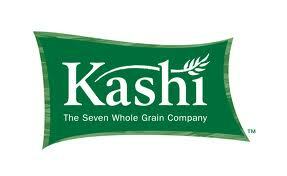 Kellogg’s, which owns Kashi, certainly took the ‘natural’ foods gig and ran with it, didn’t they? You won’t find the Kellogg’s name anywhere on any of the Kashi products, or on the website. Perhaps because they know that savvy shoppers automatically can figure out that their products are overly processed junk foods that contain equally junk ingredients. By purchasing Kashi they automatically bought into the ‘natural’ foods market and started a blitz advertising campaign acting like they are the warriors for ‘real food’. Their commercials always have one of their bohemian employees walking around touching food, nodding at native people and talking about how concerned they are about the environment. Well, if Kellogg’s really cared about the environment they wouldn’t be purchasing GMO laced ingredients, would they? GMO crops contaminate other crops and who knows what the hell the end product does to our health! All of this has me thinking about whether or not Kashi’s organic products are actually organic. Why only make a few organic and not the rest? It’s like they got lazy at their factory and decided it wasn’t worth trying to be truly healthy all the way. Do they even make their organic cereals in dedicated facilities, or do they make them on the same machines as they make their non-organic products? I guess we’ll never know. Do you know what I would like to see? More lawsuits brought upon companies such as this who claim that their food is healthy and natural when in fact it contains GMOs. A lawsuit has been filed in California against ConAgra foods for promoting Wesson oils as 100% natural, when in fact it contains GMO ingredients. If this lawsuit goes through and succeeds it may set the stage for other companies being held responsible for their fake claims. Never trust what a company says. If they are pushing their whole ‘natural’ angle so hard that it hurts chances are their product isn’t really as natural as they claim it to be. Always question these companies when it comes to their products and their advertising tactics. Posted in Fake Health Food and tagged Kashi, Organic. Bookmark the permalink. It has some fat, but fat isn’t totally bad for you, and in this it is not of the saturated variety. It’s got quite a bit of sodium, so if you are watching your salt intake it may be best to avoid this product. Otherwise it looks like it really isn’t too bad for you and there is a decent amount of protein in it. I fried three of these up today and put them in my spinach salad. No, they do not taste like bacon. I used to love bacon and eat it all the time so you can trust my opinion on that! It tastes mainly of soy sauce and smoke. Not altogether a bad taste but it is kind of salty. Make sure you have some water on hand if you eat any of it. I like it enough that I will buy it again because it’s a good source of protein. I found mine at Whole Foods but I have also seen it at Publix and Earth Fare. At all of those places it runs a little over $4.00, so it’s a little pricey for only three servings. 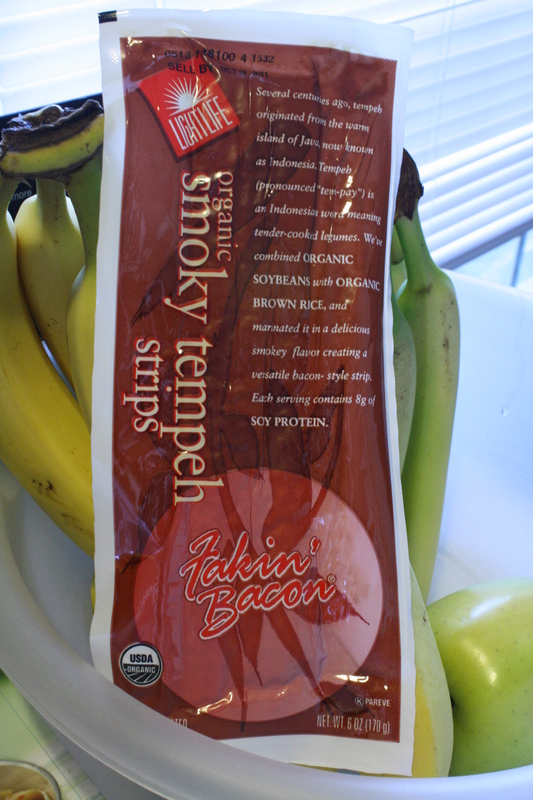 Posted in Food Review and tagged Fakin' Bacon, Organic, Soy. Bookmark the permalink. 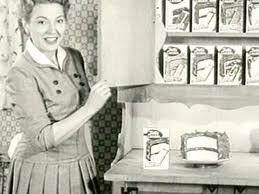 I have some fond memories of the Betty Crocker brand, despite the fact that I would in no way buy any of their products now. Like the time I used their lemon cake mix to make a lemon-lime soda cake with pineapple curd. That was some pretty yummy stuff, unhealthy but yummy. Or the times in which I was too lazy to make my own cake and bought their pineapple upside-down mix. Well, those warm and fuzzy memories have been torn apart and scattered in the breeze. I was genuinely wondering why they would only ask ‘moms’ such a question. Childless women and even men also like cake and all sorts of desserts. I went happily around the net for about twenty minutes afterwards thinking that I had done nothing wrong. Boy, did I have a surprise waiting for me! Betty Crocker not only deleted both my wall post and my response, they also banned me from making wall posts and made me ‘unlike’ them. Yes, apparently Betty Crocker does not like anybody who mentions the word ‘organic’ or who is not a mom. When a company has a Facebook page one assumes that they are open to discussion about their products and are open to hearing suggestions brought forth by consumers. Apparently the only purpose of their page is to advertise their products and to showcase on it consumers who don’t question what is inside of them. I wonder then how seriously does Betty Crocker actually take the general public? It really seems as if they are living in their own little cake world in which all consumers are happy with their products and will buy any new disgusting concept that they bring forth to the market. Contending with a questioning consumer is obviously not something Betty Crocker is good at or they wouldn’t have deleted my posts or banned me from posting on their page. I am not a mom and I eat pretty healthy, so I am some sort of exotic beast that they must push out of their cake jungle instead of responding to me and showing me some respect by answering what I wrote. I don’t in any way fit into their demographic, so I must be ignored. What has this taught me? This whole thing has just confirmed what I have already known; most food companies do not care about what you think at all. They really don’t. As long as there are people out there who will buy and eat their junk they will ignore those who question what they make and how they conduct business. The most important thing that we can do is to keep questioning them and not let them think that we are just going to go away when they ignore us. In order to gain respect you have to give it and I have none for Betty Crocker. Posted in Rant and tagged Betty Crocker, Cake, Rant. Bookmark the permalink. Who Really Owns Alexia Foods?